HAPPY DONABE LIFE - Mrs. Donabe's Rustic Japanese Kitchen: Hainanese Chicken Rice...Chicken 3 Ways! 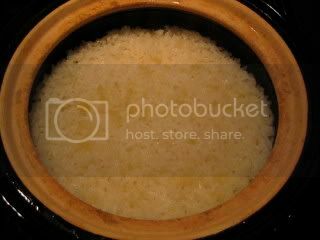 I made Singapore (Hainanese) Chicken Rice with my donabe (clay pot) tonight. It was simply phoenomenal! This time, I used the bone-in chicken thigh meat for this dish. What I love so much about this dish is you can enjoy three different dishes out of one chicken. Meat, the rice cooked in the chicken stock, and the chicken soup. I posted the recipe on toiro's website. The rice came out so shiny and tasty. The chicken was really tender, too. Out of the two kinds of sauces I made, I really liked the ginger-yuzu jam sauce.